Just like the tangy fruit after which the beach is named, Tamarindo is a delight for the senses. A former sleepy fishing village, Tamarindo has quickly become a hotspot for surfers, thrill seekers, nature lovers, partiers, and foodies. Just 30 miles from the Liberia International Airport, park yourself in Tamarindo for beautiful beaches, chic cafes, amazing restaurants, charming boutiques, and a thriving nightlife. 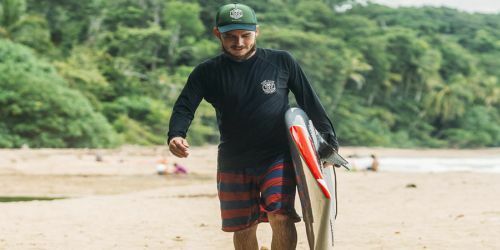 We offer 2 types of packs: a surf school pack, for beginners and intermediates, and a surf guiding pack, for intermediate and advanced; with different accommodation options, from the shared room to the Deluxe private room! Costa Rica is easily accessible by international flights landing at San Jose International Airport (SJO), around 5 hours drive to the camp; or landing at Liberia airport (4,15hrs drive to the camp). Surfcamp shuttle: We offer a shuttle service from the airport for USD 35 per person. Rental car: We recommend renting a car to drive around Costa Rica. Taxy: Getting to the surfcamp by taxy from Tamarindo airport is convenient and fast, costing around 10 USD. Public Transports: From the 7/10 bus terminal in San Jose, ask for the direct bus to Tamarindo run by the Alfaro bus company (tickets start at $10). This bus leaves at 11:30AM and 3:30PM every day. When the bus arrives to Tamarindo, the bus driver will announce the last stop – this is where you should get off. Walk straight for about 100 meters, take the first left, and continue straight for about 2 minutes. You will see our surfcamp sign on your left. Most nationalities do NOT need a special visa to go to Costa Rica (90 days on arrival). It is recommended to take various copies of your passport with you, if the original gets lost. Public and private hospital facilities have good standard level, however, we recommend traveling with an international travel insurance.